Freshman Savannah Grandovic is the president and creator of John Carroll’s new student organization Savvy Headbands. The first meeting for this organization is Monday, Feb. 18. Savvy Headbands is an organization created to help women who have lost their hair due to cancer by giving them headbands, so they can feel more confident. Grandovic cited her grandmother as inspiration for Savvy Headbands. When Grandovic’s grandmother had breast cancer, she lost her hair. Grandovic said she could see how hair loss was affecting her grandmother. With her grandmother’s hair loss in mind, Grandovic decided to knit a headband to cover her grandmother’s head, so she would not have to walk around with the stigma of being a bald woman. Once Grandovic’s grandmother passed away, Grandovic was looking at some old pictures, and realized that in every photo her grandma wore the headband she had made. It was at that moment when Grandovic realized, “My Grandma really loved wearing my headbands.” This was the start of Grandovic’s passion for helping women with hair loss because of cancer. The process of starting Savvy Headbands was not the easiest. Grandovic had to find a club adviser as well as get a petition signed, so the University would consider Savy Headbands an official student organization. Grandovic explained that students do not need to know how to knit when joining the organization. The Savvy knitting committee is in charge of teaching people how to knit, specifically teaching them how to knit a Savvy Headband. When it comes to the potential of the organization, Grandovic thinks there are plenty of possibilities. There will be a design committee whose specific job is to put inspirational messages like Bible verses or inspirational quotes on the headbands to help inspire the women who are struggling with cancer. 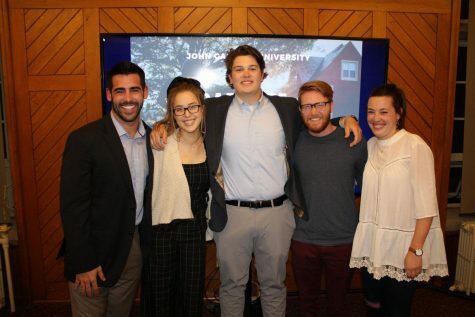 Grandovic also stated that the organization will have fundraisers here at JCU in the future and the club will partner with medial institutions like the MetroHealth, Rainbow Babies and the Cleveland Clinic to raise money.